Congratulations, Whitney, winner of the Confituras sampler! Thanks to everyone who entered– it looks like all of you have very tasty meals ahead! I wish I could get everyone who reads my blog a Christmas present, but I don’t know where all of you live. And if I did, that would be creepy. So. 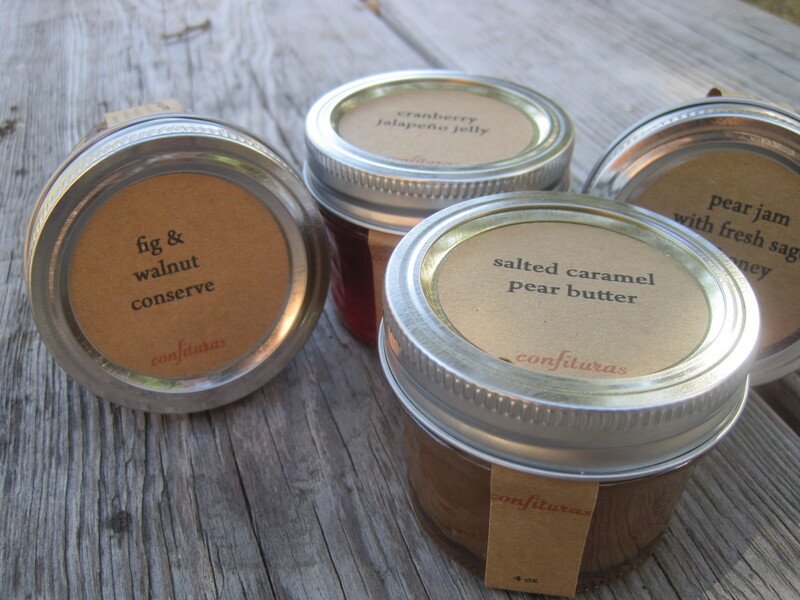 I’m giving away this sampler of Confituras jams to one lucky commenter on Tuesday, December 21st. These jams are available at most all of the Austin farmer’s markets, through the Confituras website, and at a few other retailers around Austin. However, they’re selling out really fast with the holiday approaching. To win the jams, leave a comment on this post telling me what you’re making for Christmas dinner. I’ll select one winner at random from all the comments on Tuesday morning, 12/21/10, and mail the jams to that person the same afternoon. Good luck, everyone. I can’t wait to hear about your holiday cooking plans! This entry was posted in Contests & Giveaways and tagged Christmas dinner, Giveaways. Bookmark the permalink. i THINK i’m cooking salmon, roasted brussel sprouts, mashed potatoes and walnut brownies. Christmas dinner will be ham since my father always insists upon it. My favorite meal is actually Christmas brunch where I will be making a puff pastry breakfast casserole and we will indulge in peach Bellinis while the kids open presents. 🙂 These look yummy and I wouldn’t be too freaked out if you showed up at my house. Hope your holidays are happy! I am not making anything! Because I will be at my in-laws’ in Arizona! Hooray!! yum! well it’s the boyfriend’s brother’s birthday that day so the only thing i’m making is room for lots of cake! muahaha. i should win for sheer hilarity. Making mini grilled cheeses with potato bread and asiago cheese for starters. Then turkey with oyster dressing, mashed yams with cardamom, lightly steamed green beans with toasted hazelnuts and fudge, lots and lots of fudge. I’m making romeritos, a Mexican Christmas dish. FUN! We eat tamales every year for Christmas, so I won’t be making anything. We’re actually doing brunch this year due to juggling many families. So breakfast casserole, biscuits and gravy (Confituras preserves would be great on the biscuits too), fruit salad, chocolate souffles and a yet-to-be-determined cocktail! Since my sister and I are both celiac the menu will be all gluten free. The plan is to have tamales Christmas Eve and stuffing, ham and, green beans and of course, pecan pie-traditional in every sense of the word. These jams sound yummy, I’ll look for them next time I’m at FM. Thank you for this posting. Checked out Confituras.net and was very impressed with their products. Just finished ordering a gift basket as a hostess gift and I can’t wait for the recipient to receive it. Much appreciated for the info! I would love to see Greenling carry Confituras products.